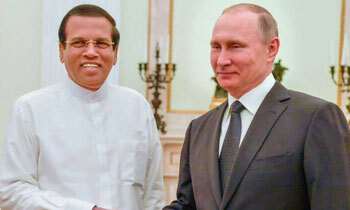 While congratulating Russian President Vladimir Putin on his election victory, President Maithripala Sirisena today said Sri Lanka was confident that Russia will achieve new level of progress under the leadership of President Putin. So how come, Putin did not say the same thing about you when you won? Mr. President, the whole world has a confidence of what Russia will do. Putin is a different caliber of a person. Be like Putin! That is exactly what he is doing in Syria in help gassing the innocents! We are also undergoing a new level of negative progress (regress) under your leadership!